For six weeks our What’s Your Story? writers came together to tell their tales of Granby Four Corners. With such a wide range of participants we heard local Liverpool stories from years past and aspirations for the years ahead. With the age varying from 7 to 70, we discussed the shops, the culture, the clubs, the history and of course the people. This group had the chance to express their stories about the past but also to reflect on how things have changed and what they would like to see happen to the area now. As well as a weekly group, tutors Tony Wailey and Curtis Watt dedicated time to talk to residents of the area such as Hector Peterson Court, the Granby Somali Men’s Centre and Lodge Lane Somali Women’s Group. With help from the tutors, these spoken stories were shaped into creative writing pieces and poetry which has been combined into a book. 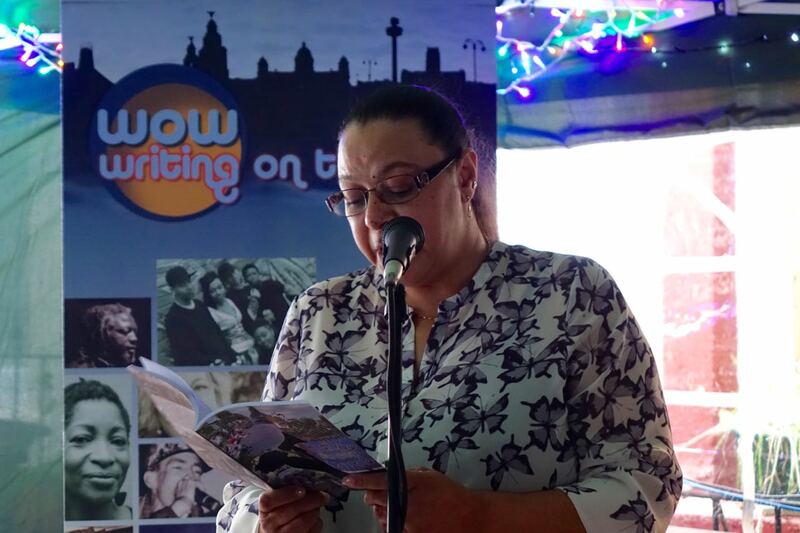 During the Writing on the Wall 2015 Festival some of the participants read from their work at the Granby Four Streets Market. Despite the wind and the rain the community pulled through and proved what Granby Four Streets Market is all about, and essentially what the whole project has been about. We had a great day and our writers read fantastically. September 3rd 2015 saw the launch and celebration of a brand new book called What’s your Granby Story? The directors and staff at Writing on the Wall arranged the launch event following a six-week writing project involving the local community. The publication is a collection of monologues, poems and stories. Granby, or if you prefer, L8, seems to have shaken off the darkened image of the infamous Toxteth Riots; an unrest that branded Granby as a predominant ‘No go area’, a place to avoid at all costs. The repercussions of those riots led to years of national ignorance and neglect. The launch night however did not reflect any of its notorious history and instead revealed a mixed community that still exists and continues to make everyone feel welcome. The books sentiment shows the resilience and tolerance that the people of Granby have endured over the years. It is a collection of written works that highlights real grit, determination and character. This can be found in poems such as Martha Said and Liverpool 8 and a monologue entitled Abdi’s Story, that gives a brief emotionally charged account of settlers who came to Liverpool to avoid conflict in their homeland. Another theme that underlines this book is the strength of women. Mothers and daughters alike are the very backbone of both past and present times; each generation standing firm in order to claim and shape family identities. They are active and continue to reinvent the Granby area. There is a strong presence of the seafarer and stories are told and worn like a time-honoured badge. Settlers of Granby came from as far and wide as Trinidad, Jamaica and Somalia to name but a few places. Granby came from the sea, so a badge comes with the territory. Ultimately, the real impact of reading What’s your Granby Story is a sense of the warmth and nostalgia that we find within these memories, displaying a human instinct for survival that makes past struggles and sorrows become bearable for those families who affectionately call Granby their home.